Our last day in Barcelona (three days was the perfect amount of time for a city break here) was a bank holiday (just like in the rest of Europe) and all the shops (apart from one shopping centre) was closed. It wasn’t warm enough for the beach either so we walked around the city some more (we accumulated lots of steps this weekend!). Up to Plaça Catalunya and along Las Ramblas. The former was pretty quiet but Las Ramblas was packed with people. Why we weren’t sure as there’s nothing much to see and apparently lots of pickpockets. We also walked around El Raval, the neighbourhood of our lunch restaurant, Bar Cañete. It was a little run down, but it probably looked worse with all the shops closed. The shop windows are covered by a metal door, usually covered in graffiti, which doesn’t look all that pleasant but obviously serves a purpose. Our reservation at Bar Cañete was for 1pm, when the restaurant opened for lunch and when we got there a few minutes before 1pm there was already a queue of foodies outside. We got seated straight away and the restaurant was full in minutes! Our waiter was very efficient without stressing and really helpful suggesting dishes and wine. The ambience was great from the start and the food blew us away. The pan con tomate arrived to the table shortly after having ordered it and it was the best we ate in Barcelona! The bread was flaky and crusty but still a little soft and it was just the right amount of tomato, garlic and olive oil. And love the large portion size! 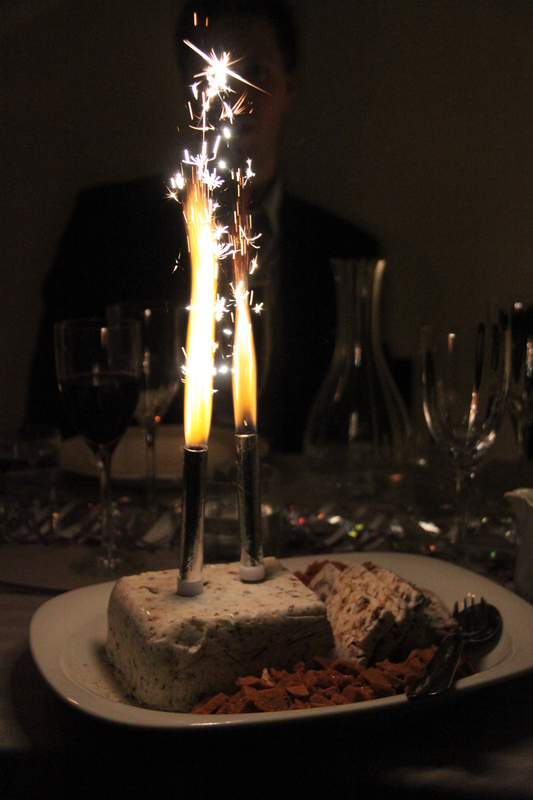 The white asparagus cooked to perfection and recommended by our lovely waiter was amazing! So fresh and loved the subtle flavours. As you may know by now, I can never resist a good croqueta and the two types on offer here were certainly worth trying. The round one with jamon iberico was seriously nice, but the oblong lobster croqueta was even better. Absolutely delicious! The next dish was this “meatball” as it was called on the menu. We didn’t really know what to expect but we were both surprised and delighted to realise it was their version of patatas bravas, but with pork. The ball was made from mashed potatoes with bits of pork mixed in, coated in breadcrumbs and fried, then covered in a mayonnaise sauce and a spicy tomato sauce. OMG – it was incredible! So nice in fact we straight away ordered another one! The green been and shaved asparagus salad with nuts was also really nice and worked really well with the creamier dishes. We also had these lovely fried artichokes, but the portion was so large we couldn’t finish it. So sad. To finish off our meal we had the suckling pig with potato mash and the most delicious sauce. I like to finish a tapas meal with a main course-like dish as it fills you up differently than the more snack-y bits. This was really heavy but absolutely amazing. No pudding required. This was the perfect way to end a perfect (apart from the not so warm weather) weekend in Barcelona with the perfect travel buddy! For New Year’s Eve my assignment was to make a lobster soup with sherry, so that’s what I set out to do. But as I needed lobster shell for the stock I thought it best to incorporate the lobster meat as well and did so by serving a delicious lobster toast (on butter-fried bread!) along side it. So yummy! Obviously one can make the soup sans toast the day after a lobster feast or freeze the shells and use them another day. Same goes for prawn shells; you find a great recipe for prawn soup here. Remove the lobster meat from the shells and set aside. Chop the shells very coarsley (it’s only so they fit better in the pan later). Place the shell in a large cooking tray with a little oil. Also add large pieces of carrot, onion and celery/fennel. Roast for approx 20 minutes on 180/200C. Transfer the shells and vegetables to a large saucepan with a lid. Add plenty of water (3 litres) and bring to the boil. Add dill stalks and fennel seeds. Place the lid askew and cook for 30-45 minutes. Sieve the stock and reduce (high heat, no lid) until approx 1 litre remains. Add salt and pepper and taste. Add some concentrated lobster stock if needed. Add the sherry to a clean non-stick pan and let it bubble for a minute. Add the stock and cream and let it thicken. Add the maizena/corn starch to thicken the soup further. Sieve if you see any lumps. Season to taste with concentrate, salt, pepper and sherry. From the lobster meat I used approx 1/4 of the meat, the smallest pieces, to place in the soup bowls. Melt the butter in a pan and add the chopped shallots. After a minute add the lobster meat and add the sherry. Add salt and pepper. Remove the pan from the heat and add the dill. Divide between the bowls and pour in the soup. Chop the lobster meat (not too finely). Add 4 tbsp mayonnaise to a bowl and mix in the meat. Add more mayo if needed. Add mustard, dill and cayenne after taste. Season. Place cold until serving. Remove the crusts on the bread and cut into two diagonally. Fry the slices golden brown on both sides in butter on medium-low heat. Divide the lobster mayonnaise between the toasts and serve with the soup. The second day in Cape Cod, we managed to catch the boat to Nantucket and explored the pretty island for the day (top tip: book your ferry in advance!). When we arrived back into Hyannis, we headed straight for dinner, eager to eat at a more socially acceptable time than the evening before. We went o Spanky’s Clam Shack, which seemed like the place to eat in this little town, and joined the queue at the bar. I’m really not a fan of waiting or queuing in general but when I can sit at a bar and sip a drink (in this case frozen strawberry daiquiri) I really don’t mind. When we were shown to the table (after only a ten minute wait) we got snacks straight away, like they could sense our hunger. I really liked the crab dip and crackers, although the presentation could have been improved on. But this is one busy restaurant so I can see why they like plastic bowls and wrapped crackers. We got our starters quickly too. Sinead got another mountain of crispy calamari with a tomato chilli dip. I tried something completely new for me; a stuffed quahog (no, not a Family Guy reference, it’s the actual name of the clam). It’s a huge clam filled with breadcrumbs, butter and herbs, and I really liked it. But it’s quite compact and therefore really filling. While we were munching on our starters we saw lobster after lobster leaving the kitchen. We got the main courses while we were still eating our starters (we had already sent them back once so felt bad if we did it again). But considering the size of the starters it would have been nice with a pause in between courses. Anyway, Sinead’s chicken with kale and fries was really nice. But I think my clam bake was even better. The lobster was huge and perfectly cooked and the corn was the best I’ve ever had. I also had a plate full of a local type of clam and as I hadn’t come across them before I got a lesson in how you peel and eat them from our lovely waitress (it required removing them from the shell, pull of a membrane and then soak them in stock for quite a while to remove the sand). It’s always fun to try new things, and the clams were quite nice but I prefer the regular sweet ones. I also got a baked potato which I barely touched as the lobster, corn and clams were more than enough for me. I really liked this place, but be prepared for big huge portions and a quick pace. When I was in New York in August I met up with two friends I know from London. One has moved there for the first time, and one has moved back. And they both recommended ABC Kitchen to me. As I trust these friends, I made a reservation that day. For the same evening! So off we went, Sinead, her friend Hazel from home, and I. After waiting only a few minutes at the bar our table was ready (which was good as it proved near impossible to get a drink at the bar). As we walked through the restaurant I noticed the lovely interior. Part Scandi chic with lots of clean lines and white, part romantic with a few rustic touches and pretty pastel flowers. Hazel’s heritage tomato toast was simple but nice. Good produce goes a long way. For her main course Hazel had the lovely fettucine with peas, sweet onions and basil and pistachio pesto. Sinead had the fried chicken with collard greens and a basil and hot sauce butter. A little spicy but really nice. I decided to go all out with a whole baked lobster with oregano and a lemon and chilli vinaigrette. And mash on the side. Maybe not the most conventional choice but the kind waiter assured me plenty of people order lobster and mash. 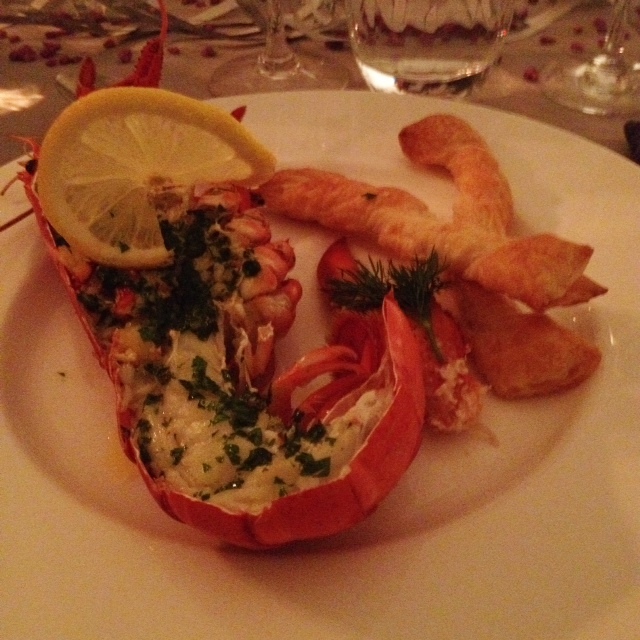 The lobster was seasoned very differently to what I’m used to but stunning! Can’t wait to come back here on my next New York trip. My bestie Emma and I have always liked a good party and quite often organised New Year’s Eve parties ourselves. Although it has always been lots of fun it takes quite a lot of time and effort to do it well so, in lieu of a big NYE party to go to, we decided to go back to basics for once. Just a few people, four in fact. Easy but classic and very tasty food, champagne and nice wines to drink and just lots of fun because you’re among great friends. I wouldn’t mind a repeat this year, guys! 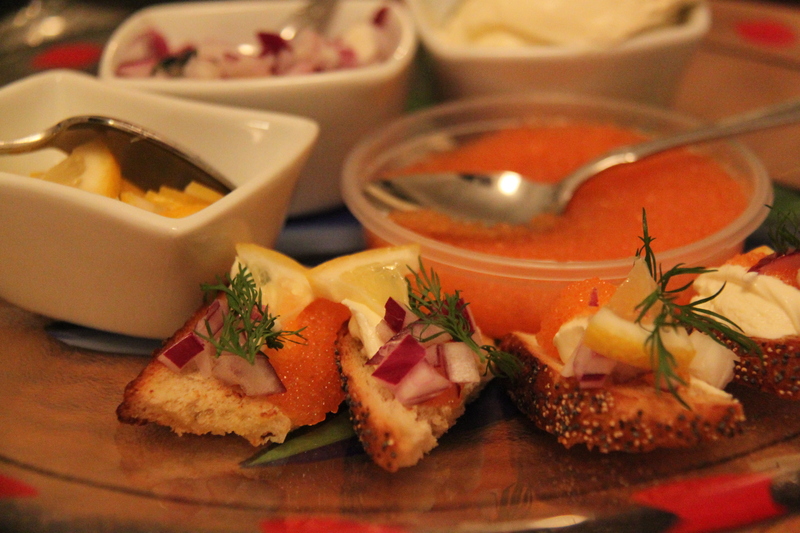 After watching some ice hockey in the afternoon (the Junior World Championship was on in Malmö) we started our evening with Champagne and canapès consisting of crispy bread fried in butter topped with creme fraiche, Swedish caviar (löjrom), red onions, dill and lemon slices. It doesn’t require much cooking but it is so delicious it still impresses your guests! 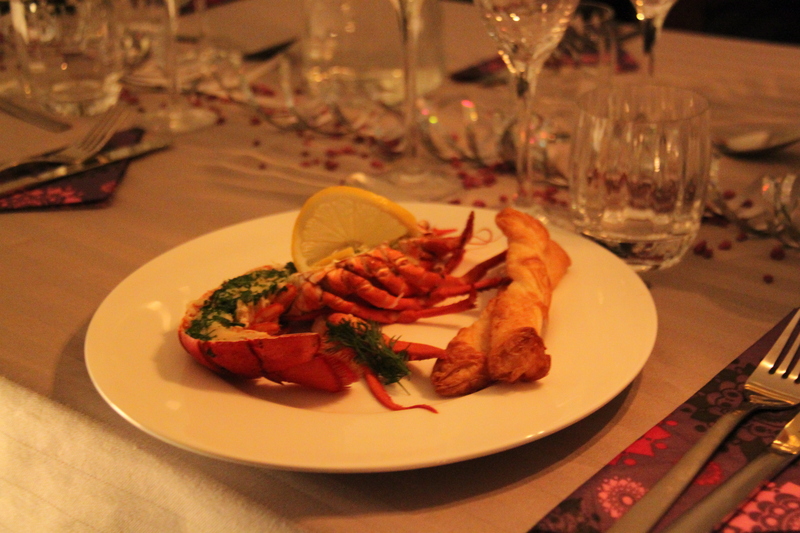 Our starter was lobster with melted garlic butter and puff pastry twists. Again very simple, but absolutely gorgeous! The even bigger hit was the main course with incredibly tender fillet of beef that I managed to buy in a regular (but very good) supermarket (where I also found bone marrow – I was in heaven!). 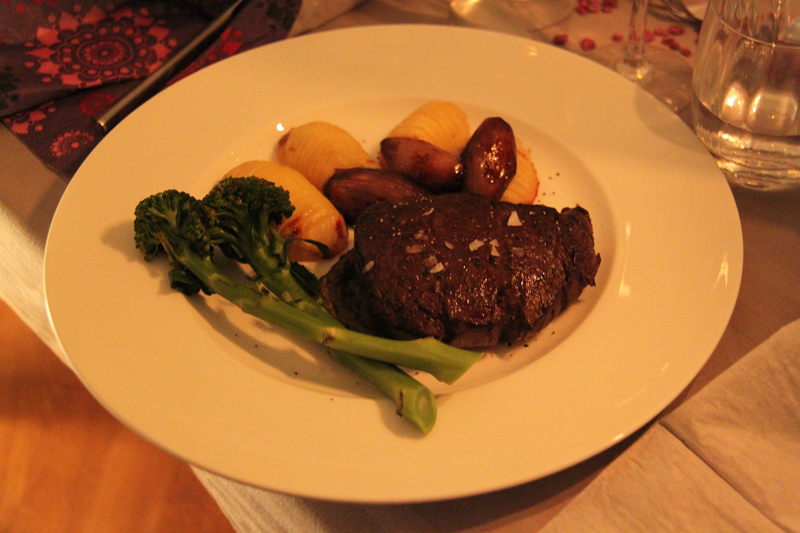 Served rare with a wonderful mushroom crème, tenderstem broccoli, caramelised shallots, Hasselback potatoes and creamy red wine sauce, I think this was everyone’s favourite dish. So so delicious! I made the same dessert as last year, as it was such a success! Fluffy parfait with chopped dark chocolate and caramelised hazelnuts served with honeycomb and butterscotch sauce. Delicious! 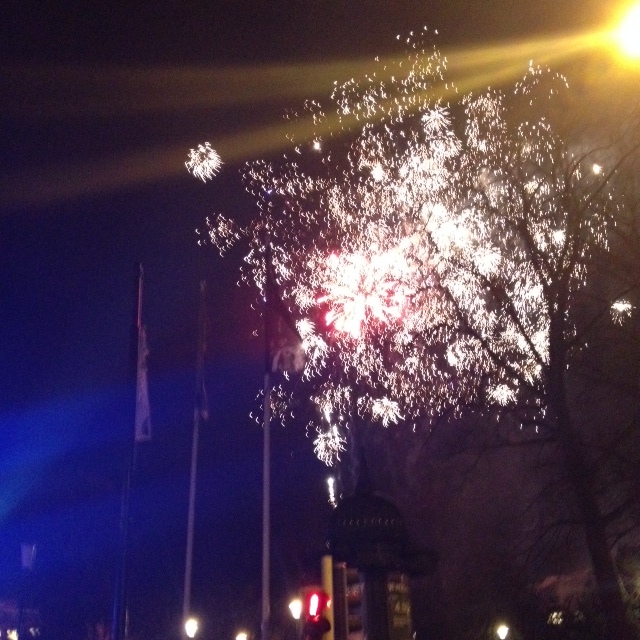 Just before midnight we walked down to the Opera in Malmö where the fire work display was going to be, toasted in some more bubbly, watched the fireworks and went back inside to eat and drink some more. It was a great evening! Heat up a frying pan on medium heat and melt half the butter but don’t let it burn. Fry the bread slowly first on one side and then on the other until crispy and golden brown. Add more butter when you turn the bread. Cut into smaller pieces. Chop the red onion and let it soak in icecold water a few minutes before serving to lose some of the sharpness. Drain before serving. Either place a dollop of creme fraiche, caviar and some red onion, dill and a small lemon segment on each bread piece or serve in bowls and let people assemble their own canapès. Start with the puff pastry twists. Cut the roll of puff pastry into 2 cm wide strips. Twist each strip a few times and place on a lined baking tray. Sprinkle with sea salt flakes and bake in 225C oven for 8-10 minutes or until golden and crisp. Leave to cool. Keep in an airtight container. Mix the softened butter with garlic, parsley and some white pepper. Cut the lobsters in half lengthways with a sharp yet sturdy knife. Remove the black vein and any roe. Rinse very carefully. Remove and open the claws and keep the claw meat on the side. Place the lobster halves on a baking tray, spread with butter and place in a 200C oven for about 10 minutes. Serve with a lemon wedge, a fresh claw each and the puff pastry twists. Start with the sauce, crème and onions (recipes below). Add the cream to the red wine jus, let it thicken and season to taste. Can be reheated before serving. Peel the potatoes and cut in half lengthways. Put them flat side down and make small incisions creating a ridged effect with a sharp knife. Don’t cut all the way through and leave 1-2 mm between the incisions. Place the potato halves on an oiled baking tray, drizzle with mild oil and add salt and pepper. Bake until crisp and golden brown, approx 30-40 minutes in 200C. Brown the meat on all sides. Season well with salt and black pepper. Place in oven on 150C until the inside temperature of the meat is 55C (for medium-rare). Rest the meat a few minutes before serving. Cook the broccoli in salted water until soft but not mushy. Drain and add some more salt. Plate with the mushroom crème underneath the meat. Soak the ceps for a few minutes then squeeze out the excess liquid. Chop all the mushrooms roughly. Heat up a knob of butter in a frying pan/sauteuse on mediun heat and add shallots, garli and mushrooms. Fry slowly adding more butter if needed. Once the mushrooms have browned, add the mustard and Cognac and let the liquid evaporate. Add the cream and let the mixture thicken. Blend to a smooth paste using a stick blender. Adjust the seasoning. Heat up again before serving. Use a non-stick pan. Caramelise the onions in the butter on medium heat, it takes about 5 minutes. Add red wine, stock and honey and let the liquid evaporate (without a lid) until you have sticky dark brown onions. Add salt and pepper.